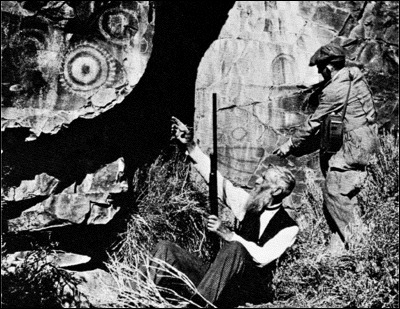 Here's a photo of Captain O. C. Applegate showing rock writing images to A. W. Collier in 1915, and a recent photo of the same site. It is on Sheepy Ridge along the western shore of Tule Lake. The word sheepy comes to us two ways. First, it is a pioneer corruption of the Modoc word Shapasheni which means, "where the sun and moon live." To the west there is a ridge, creek and village site by that name. Second, as the word came more and more into common use, it also referred to the bighorn sheep who lived on the ridge. Though they were wiped out by disease and over-hunting, there was an attempt to reintroduce the sheep in the 1980s, but that was unsuccessful. 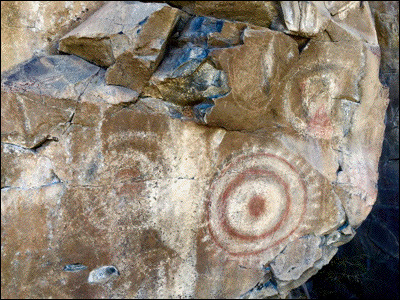 The rock writings are magnificent, and were done in red, black and white paint on cliffs that face east, looking across the lake toward the rising sun and the center of the Modoc world. They contain a lot of sun symbols. I'm hoping that Roy Phillips, co-director with me of the Reading the Rocks project, can join me there soon so we can begin figuring out the story the symbols tell. And it had better be soon! I'm getting old, and he's a lot older than I am. But he's also a genius when it comes to translating the symbols.